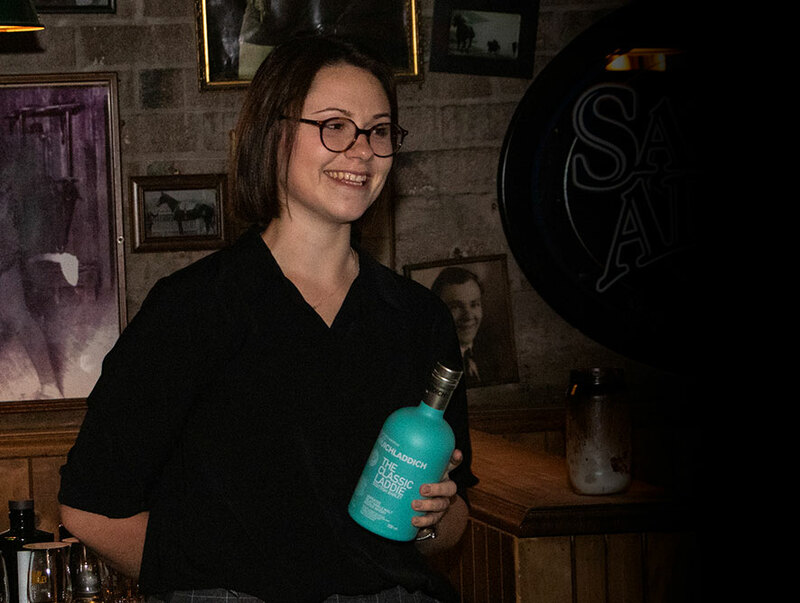 Port Charlotte 10 recently launched in Australia and Brand Ambassador Chloe Wood visited Australia to explain why this Islay whisky is so unique and unveiled this distinctive whisky in its distinguishing new packaging. “The opaque green glass is a nod to the heavily-peated “Islay” category, whilst the modernist design clearly reflects the progressive values of the distillery” explained Chloe. “Fans of the smoky Islay malt can be assured that the style of the spirit remains unchanged,” she remarked. Port Charlotte 10-year-old has been conceived, distilled, matured and bottled on Islay alone. The ambition was to make the ultimate “Islay” Islay whisky. A whisky made by people, not software; a whisky watched over every day of its maturing life by those who made it; a whisky born of a community with a vision and a mission to kick start a single malt whisky revolution, this Port Charlotte 10-year-old is who we are. This is where we’re from. We are Islay. The Progressive Hebridean Distillers believe an “Islay” whisky should live and breathe the fresh salt tang of Islay air, all its life. This is not a spirit distilled on the island and immediately shipped off to the mainland to mature in some undisclosed warehouse” says Islay born and bred Chloe Wood. The young workforce at Bruichladdich distillery makes no attempt to draw finite conclusions over the influences affecting the flavour of single malt scotch. Instead, they explore the dynamic influence of barley provenance, cask exploration and time – all of which are demonstrated in the new port charlotte whisky. Bruichladdich distillery CEO Douglas Taylor further clarifies “our distillery project is built around certain key principles, which drive everything we do. The authenticity, provenance and transparency of our spirit is paramount. We are committed to source 100% of our barley from Scotland, 33% of which is now grown on Islay. We have reintroduced ancient varietals and experimented with regionality for texture and flavour. All our whiskies are conceived, distilled, matured and bottled on Islay. Unchill-filtered and colouring free, using Islay spring water.” He continues “we are committed to our community. We aim to be Islay-centric in everything we do and care about the positive economic and social impact our business has on the island. Ultimately, we are a collective of like-minded people, passionate about this island and the single malt whisky we make here”. Bruichladdich distillery, on the island of Islay, was revolutionary when it was built in 1881. Purpose-built with a cathedral-like still house, it was designed by the Harvey brothers to create the purest spirit possible. The distillery had a chequered history through two world wars and multiple ownership and was closed as “surplus to requirements” in 1994 by the Whyte and Mackay group. It lay silent until 2001 when it was resurrected by an independent group, led by wine merchants Mark Reynier, Simon Coughlin and Gordon Wright, with local man and Master Distiller Jim McEwan. 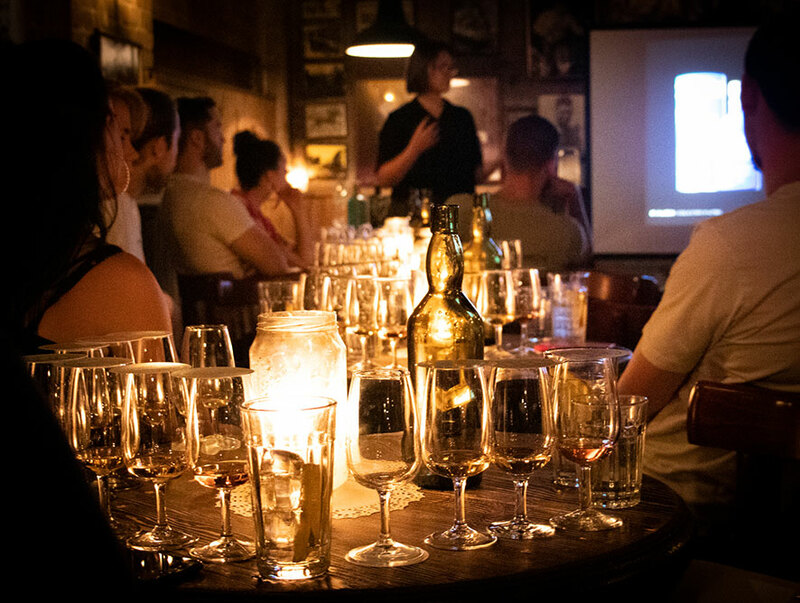 Tired of the myth and legend that surrounded the whisky industry, their mission was to create single malts with a focus on ingredients, to challenge the conventions of one distillery, one style and to push the boundaries on flavour. Two decades later and with founder Simon still at the helm, the self-titled “Progressive Hebridean Distillers” create four high-provenance spirits brands: three Islay Single Malts, Bruichladdich always unpeated, Port Charlotte always heavily peated and Octomore, the most super-heavily peated single malt series in the world, plus The Botanist – the first and only Islay Dry Gin. 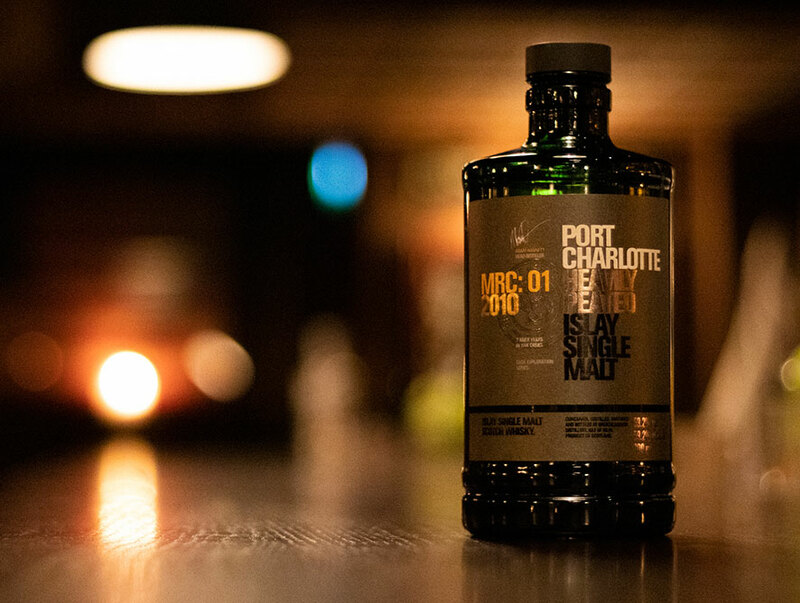 Port Charlotte 10 is bottled at 50% ABV and as with all Bruichladdich distillery malts, is distilled using 100% Scottish barley. time has brought a balance, a harmony in the combination of oak, smoke and spirit. While the smoke is always discernible on the nose it is dry, earthy, peatash in its style and so allows the oak to come forward with waves of golden caramel, fudge, vanilla custard, hints of ginger, nutmeg and clove. There is citrus fruit, coaxed from the glass with a drop of water, gentle lemon meringue and clementine. Breathe deeply and the floral aromas of wild thyme, heather and sea pink bring you to this Atlantic coast. Palate – On the palate there is a noticeable delicacy and softness in texture and style. Again, the balance of flavour is superb as the smoke wraps loosely around the sweetness drawn from deep within the oak. Coconut, vanilla custard, lemon honey combines with smoked oysters and sun-baked salty sand. The Finish – The finish is sublime, smoky sure, but also the soft sweetness of fudge and malted barley, orange, mango and Banoffee pie hinting of the depth and quality of the oak. The many layers interchange on each sip. As the smoke comes and goes so too the notes of the spirit, ripe apple and apricot, beautifully intertwined with malt and oak sweetness and that typical Port Charlotte style dry smoke. Character – Ageing for 10 years on the shores of Loch Indaal has had a profound effect on this spirit. Like sunshine on a winter’s day, this Port Charlotte 10 brings clarity and lightens the mood, welcoming and brightening the future. Click here for product information on Port Charlotte.